Gas-run irons are becoming popular in Coimbatore. Coimbatore laundryman said that LPG is far more cost-effective and safer fuel for ironing. Replacing charcoal and electricity, a laundry man in Coimbatore is using a gas connection to iron clothes. The innovative and environment-friendly move is slowly becoming popular in the city with other laundry services opting for gas iron boxes. "Earlier we used to use charcoal for ironing. There was always a fear that fire pieces or ash may fall on the clothes and damage them. 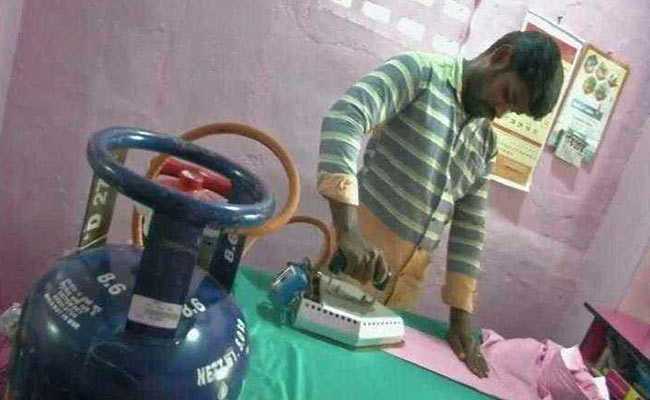 We then started using electric iron box, but there was always a fear of electric shocks," said the laundryman, Prabhu, who is happy using user-friendly LPG-run irons. He said that LPG is far more cost-effective and safer fuel for ironing. "With just 5 kg of gas, we are able to iron more than 800 clothes. Time taken for ironing the clothes is also quite less as compared to other fuels," said Prabhu. Like Prabhu, other laundrymen are ready to make a switch and are hoping for a reduction in the prices of the LPG cylinder and gas iron boxes. "If the prices are reduced, then many laundrymen in the region will be happy to switch to gas-run irons," he said. In an effort to shield women and children from the kitchen smoke, the government had launched Ujjwala Scheme in 2016. This meant that traditional firewood used for cooking in rural households would be replaced by more efficient and cleaner liquefied petroleum gas. While free cylinders have been provided by the government, many households are struggling to get the gas re-filled due to high cost.